We were surprised by the recent debate about whether North Korea can domestically produce UDMH. Working with my colleagues at CNS, we have translated several North Korean scientific papers documenting North Korea’s domestic production of UDMH and identified at least one of the sites probably associated with UDMH production, the February 8 Vinalon Complex in Hungnam. It is easy to understand this assessment. In North Korea, the domestic production of nuclear weapons—including the missiles to deliver them—is considered to have the same importance as the development of the national economy as a whole. The North Korean military fielded its first UDMH-fueled missile, the Musudan, about a decade ago. UDMH is currently produced by a number of countries around the world, and has been for many decades. The Soviet Union began to mass produce UDMH in 1959. China was producing UDMH by the 1960s. Japan was producing UDMH by the early 1970s. And by the early 1980s, India had produced UDMH at the Andhra Sugars Tunuku factory. Far from being a secret, the “formula” for UDMH is literally its name: unsymmetrical di-methyl-hydrazine or H2NN(CH3)2. UDMH can be produced by several well-documented processes, including the Olin-Raschig process which was patented by German chemist Friedrich Raschig in 1906 and optimized for commercial production by the Olin Corporation in the United States. 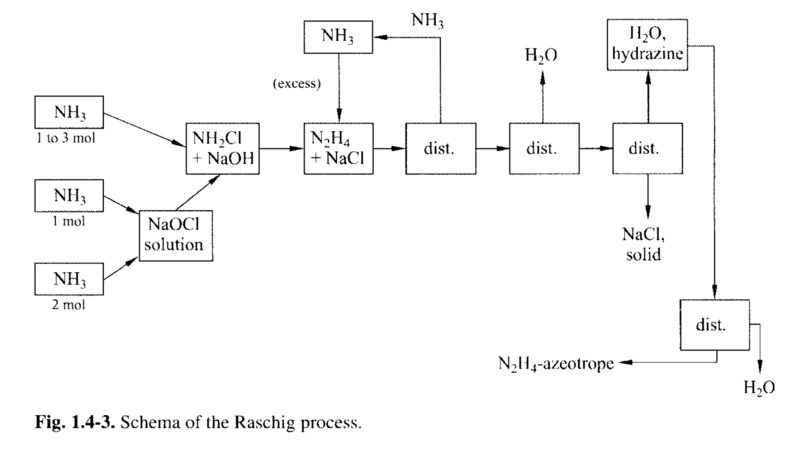 UDMH is produced using a variation of this process with dimethylamine substituted for ammonia in the reaction with chlorine. Source: Hans-Heinrich Moretto, Karl H. Büchel, and Peter Woditsch, Industrial Inorganic Chemistry, Wiley-VCH, 1989. North Korea is hardly so backwards that UDMH production would come as a surprise. Over the years, a variety of liquid and solid rocket propellants have been found in seized cargoes from North Korea. North Korea has a large chemical industry, much of which is concentrated in the around Hamhung and Hungnam. Published accounts by North Korean defectors suggested that many chemicals for defense uses, which would include rocket propellants, are produced in this area. 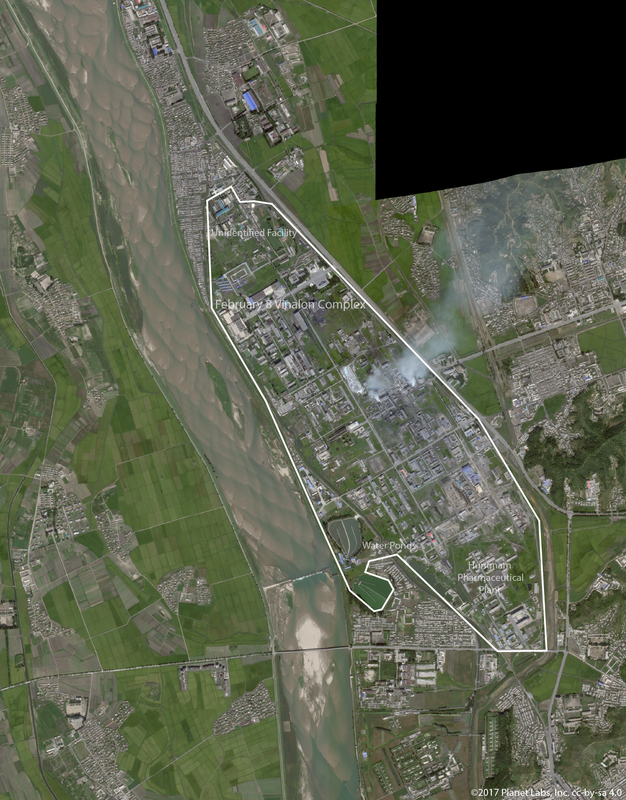 We’ve annotated a satellite image provided by our friends at Planet so you can see just how many interesting things are happening in the Hamhung/Hungnam area. • Cha Seok Bong, Kim Yeong No, “A Study on Measuring the Electroconductivity of Unsymmetrical Methyl Hydrazine-water solution,” Chemistry and Chemical Engineering, 2016, no.3, pp.41-42. These three papers describe North Korea’s production of UDMH in some detail, including the specific process used by North Korea (Raschig). Translated abstracts are available at the bottom of this post. The first two papers concern the treatment of wastewater that results from the UDMH production process — which is a real issue as UDMH is toxic. One of India’s aerospace engineers tells a story about a bull that found its way into a wastewater disposal pit from UDMH production. The workers at the plant “smelt a peculiar ‘non-UDMH’ smell,” eventually tracking it to the dead bull in the disposal pit. These papers are direct evidence of domestic UDMH production, since the wastewater is a byproduct of the production process. Moreover, rather than a press release touting an achievement, which might be dismissed as propaganda, these papers offer a rather mundane discussion of the problems emerging from the specific process to produce UDMH. The third paper concerns the electrical conductivity of a UDMH-water solution and seems less revealing, at first. It concerns the electrical conductivity of a UDMH-water solution. Electrical conductivity varies by the amount of water in the solution, meaning that a measurement of conductivity can tell one how “wet” the UDMH is. This can be used to assay the quality of the fuel. These three papers indicate that North Korea is producing UDMH, dealing with the both the wastewater from production and assaying the content of a UDMH-water solution. It is hardly surprising that the DPRK is able to do so, given both the scope of the DPRK chemical industry and the fact that UDMH is produced around the world using well known processes. The third paper, however, yields an additional secret – the probable location of the UDMH production line. None of the authors on any of the three papers is listed with an affiliation, which is not unusual. In any case, we may also presume that the location of UDMH production is a state secret, relating as it does to the production of fuel for North Korea’s nuclear armed missiles. But one of the authors – Cha Seok Bong – has both an uncommon name and holds patents on other chemical processes. Those patents provide Cha’s institutional affiliation as the February 8 Vinalon Complex in Hungnam. Of all the facilities in the area, the February 8 Vinalon Complex is the most likely to be involved in the production of UDMH. While North Korean propaganda emphasizes the plant’s role in producing vinalon – a synthetic fiber that North Korea uses extensively to illustrate its self-reliance – the United States intelligence community has long assessed the site, also known as the Hungnam Chemical Plant Pongung, as producing a number of chemicals. According to a partially declassified 1969 imagery interpretation report prepared by the CIA, the facility contained a production line to handle chlorine and ammonia, chemicals that are also used in the Olin-Raschig Process to manufacture hydrazines. It is an obvious candidate for adding a UDMH production line at a later date. Unfortunately, UDMH production does not have obvious signatures for an analyst using overhead images. Yet, we do see a number of wastewater ponds at the site. Recent construction in different sections of the plant may also correlate with the expansion of UDMH production. But it is Cha, an employee publishing research related to UDMH production, who provides the basis for our conclusion that this plant is at least one of the locations among which North Korea domestically produces UDMH to fuel its new generation of long-range missiles. 차석봉 , 김용노 , 김성국, “비대칭디메틸히드라진-물계의 전기전도도측정에 대한 연구,” 화학과화학공학, 2016, no.3, pp.41-42. Cha Seok Bong, Kim Yeong No, “A Study on Measuring the Electroconductivity of Unsymmetrical Methyl Hydrazine-water solution,” Chemistry and Chemical Engineering, 2016, no.3, pp.41-42. Is there a way to estimate volume of the wastewater ponds and extrapolate rough production of product? Probably, but we’d need to identify the buildings involved in production and make sure nothing else was going into the pond. Kinda. Using the polygon tool in Google Earth Pro, one gets about 45,000 square meters for the area of each of the north and south ponds. Something like 90 – 100k square meters for the both of them. The terrain looks pretty flat and close to sea level, so I don’t think they’re all that deep, a few meters, say three as an order-of-magnitude estimate. So ~300,000 cubic meters volume, give or take a factor of 2 or so. Per google earth aerials the ponds have been there at least since 1983, so seems like they might be general for the whole chemical area. Also looks like they have hydroelectric power on the river there? That’s right. There are a number of ponds — those were just large enough to call out on the image. We are still trying to identify which area within the complex is responsible for UDMH production. Rather well done. While Broad may not publish a retraction of his story, he was certainly provided insight ahead of publication that UDHM manufacture was not exotic merely toxic and instead of looking for imports of fuel, he should have been looking for any foreign supply of a chemical line to manufacture UDMH. If the wastewater is so toxic, why would the waste ponds be located next to the river? I would think the waste would be pumped to a location less likely to be inundated for oxidation/destruction, then released. Hungnam, aka Konan under Japanese annexation (1910-1945) was home to Nouguchi fertilizer works and a Tungsten Carbide plant. Also during WW2 Professor Yoshiro Nishina shifted Japan’s uranium enrichment project there for Japan’s Atomic bomb project. In WW2 this was Japan’s Los Alamos. It’s been a characteristic of industry not to be particularly careful about such things. And rivers supply an essential coolant and reactant, water, so factories are located close to them. The US has old mines in Colorado gushing wastewater which must be collected and stored near rivers, Ukraine has many industrial activities near the Dnieper River, Estonia had a large tailings pond located 50 meters from the Baltic Sea, and, for a while, the Soviet Mayak nuclear reprocessing plant ran its highly radioactive wastes directly into the Techa River. Why should North Korea be different? Environmental laws are being tightened, and some of the earlier messes are being cleaned up. But I think that is not a big issue in North Korea. Jeffrey, no disrespect for your fine detective work. From an operational perspective development of solid propellant Isobutyl-Methacrylate is of more strategic significance. Any chance you could do a similar job of analyzing production of solid propellants in North Korea too? What about the UGF 39°55’5.09″N, 127°38’48.10″E at Sapho-guyok? Could that be a UDMF facility of some sort? That is not the only site from which citations to NK scientific articles are available. I have been indicating in private communications what other site are currently useable.